The answer to that question is ‘it depends’. What it depends on is you. What is your definition of success when applied to your coaching business? Creating a successful coaching business is all about your definition of success. To some, it’s the ability to give up the part-time job that brings in £800 a month by replacing that sum of earned income with income from coaching. The ability to give up that part-time job might be a definition of success for them because, for example, they want to be at home with their children. To others, it’s £3000+ per month to be able to give up the day job. The road to £800pm is shorter than the road to £3000pm. When I say that creating a successful coaching business is simple, I’m not saying that it’s easy. What I’m saying is that the steps are simple. Actually taking those steps – actually taking the necessary action – isn’t quite so simple, because it requires effort from you. It isn’t something we can do for you (although we can – and do – hold you accountable). To create a successful coaching business, the first thing you need to do is to work out who is most likely to want to buy coaching from you. This isn’t about defining a niche, that’s way too broad. It’s about defining the actual individual who is most likely to benefit from working with you and, of course, with whom you’d like to work. This isn’t some tricky process in which you try to identify an area in which there are no other coaches working, it’s about thinking about you and your experience and then using that appropriately. Next, figure out what that potential client needs to hear from you in order to understand the benefit (to them) of working with you. Top tip: do not try to define coaching, or talk about mental barriers or reaching goals. No one cares about mental barriers or goals, and certainly not your coaching client – yet. What this person needs to hear from you – that list of benefits to them – becomes your unique marketing message. It becomes the message that you broadcast loud and clear both online and in person. It’s important that nobody else is delivering the same marketing message as you, otherwise, why would your client know to pick you as their coach? Finally, when you understand who your client is and what they need to hear from you, the last step is to work out where they are, both on and offline. You can see why I say that this is simple, right? 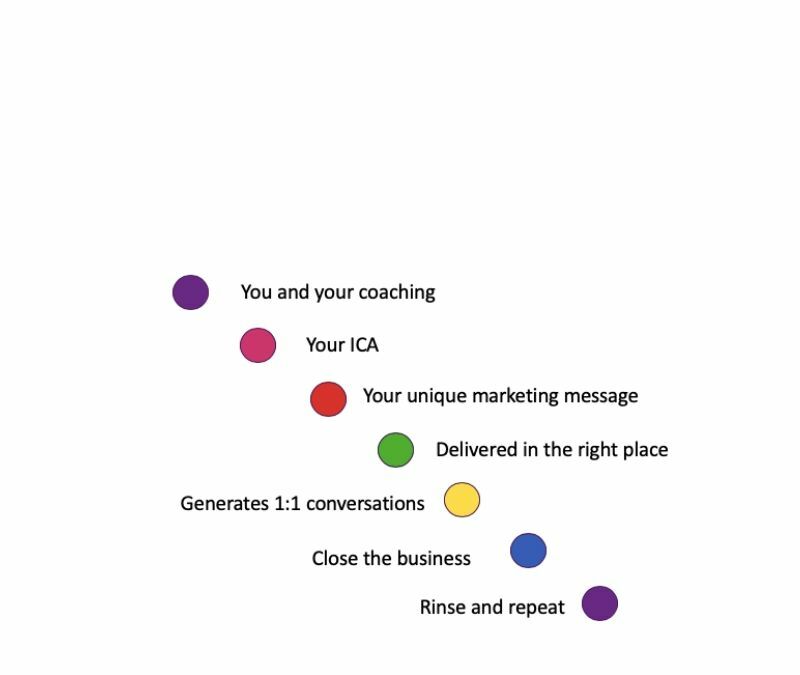 Assuming that you’ve done those steps, the next part in creating a successful coaching business is actually doing the work of being where your client is (on and offline) with the message that they need to hear and that takes consistency. Consistency is where coaches fail. Consistency isn’t easy. You’d think that as we only work with coaches – and coaches are all about the doing – that this would be a no-brainer. wouldn’t you. However, nothing could be further from the truth. The fact is that coaches are people too and people are generally hopeless about consistency. They’re good at thinking about consistency and not so good about actually doing it. With the right support (and we have mentors all over the world who can help you), creating a successful coaching business by taking those three simple steps is a case of learning a process. Actually putting the work you’ve done into action is down to you and that’s what makes it hard; we can’t do it for you. If you’re sick to death of working on your coaching business and not seeing the results you crave, why don’t you talk to us? We can help. This is where you’ll find our diary. It costs nothing to talk to us, and the benefits of doing so can be massive.